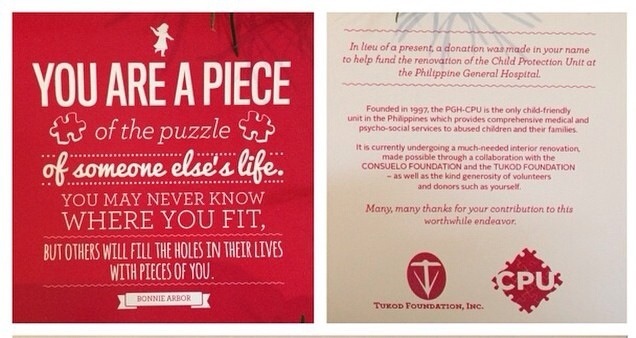 If you are looking for gifts of “great value” or a thoughful way to say you care to your loved ones, consider giving them Tukod Foundation’s christmas gift card. When you purchase one, you will be making a donation in behalf of your loved ones. Proceeds from the sale of these gift cards will help fund the renovation of PGH-CPU (Child Protection Unit), the only child-friendly unit in the Philippines that provides comprehensive medical and psycho-social services to abused children and their families. As you know, PGH is close to my heart since my daughter’s surgery there last year. I have witnessed for myself how this medical institution has been striving hard to provide excellent service to our fellow Filipinos despite the little funds that they have. Lets genuinely share and spread real love this christmas by supporting this great cause. For inquiries, you may contact Ms. Bambi Manosa through Ryan Vicente at 0917872519.